In lieu of Book Review Wednesday I want to share the Apologia meeting we had last night. Apologia is a tradition from our church in Okinawa, Japan. Once per month community members gathered to discuss a book, which would build the reader’s understanding of God, truth, and culture. The books were challenging and the discussion rich. We’ve missed it. The group in Japan was led by our dear friend Ron Coia, an English teacher for the high school students of military members in Okinawa, Japan. Ron and his lovely wife Kristie—one of my best friends—are here visiting us. We took advantage of the visit to kickoff Apologia in our community here at Redemption Parker. 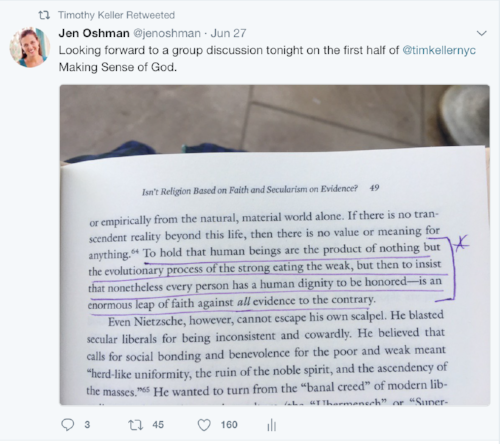 Our inaugural book is Making Sense of God by Tim Keller. Last night seven of us gathered on our back patio to discuss the first half of the book. 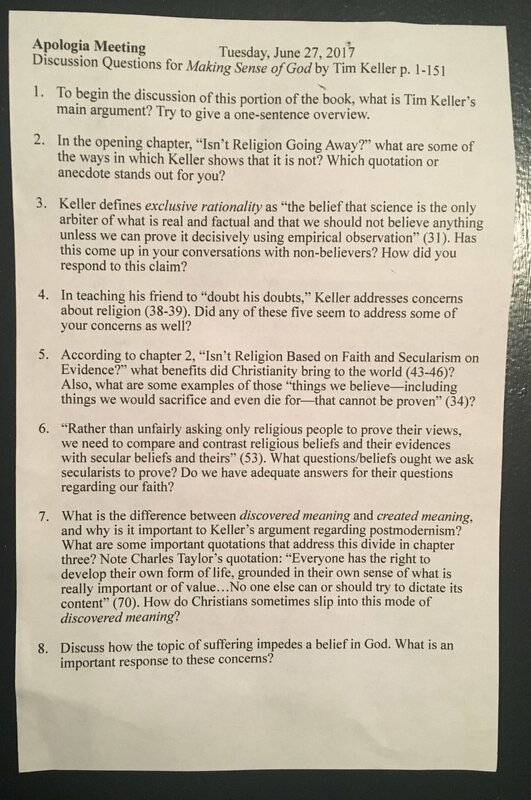 Ron carefully prepared 18 questions for us to dig in to the content of chapters 1-7, which I will post below. We made it through six questions in about two hours. I will post Part Two after our second meeting, which will be one month from now. My hope in sharing this is that others will give it a try. Reading books of substance is best done in community. The deadline and accountability of a meeting helps to push members through, while reading alone leads to the temptation to give up. Group discussion sharpens as members view the same work differently and share how their lives intersect with the message in unique ways. Many educated western thinkers assume that as people groups across the world become more developed and educated, they will reject religion. But what we’re seeing is that chosen faiths are being passed on and thriving. If religion is growing, the irreligious will need to make sense of God. Hence, this book. Early on Keller engages exclusive rationality, “the belief that science is the only arbiter of what is real and factual and that we should not believe anything unless we can prove it decisively using empirical observation” (31). Keller rightly asks, “But what is the empirical proof for that proposition?” (33). The declaration that science is the only arbiter of truth is in fact a belief, and not itself established in empiricism. Keller skillfully leads the reader to understand that secularists have no right—based on their own views—to label anything good or bad or noble or evil. 1. We learn that “the more prosperous a society grows, the more common is depression” (77). This can certainly be seen in my own county, which is America’s 7th richest, but has been witness to at least six teen suicides in the past few years. In Augustine’s footsteps, Keller articulates that “the ultimate source of our discontent is failure to love the first, the failure to love God supremely” (90). In other words, as beings created by God, we will find our greatest joy in loving God. When we rightly order him first, we thrive. 3. Chapter six is entitled “The Problem of Self.” As Keller puts it, “our culture tells us that you must look inside to discover your deepest desires and dreams and to express them. You must do this yourself, and must not rely on anyone outside to affirm and tell you who you are” (124). This—THIS!—is what I see to be wrecking havoc on women’s ministry in the church today. It ends up crushing our souls because we cannot uphold ourselves with ourselves. We need durable, robust truth. We need Jesus. 4. Though I could mention so much more, I’ll close with a quote on identity, “If I am a Christian, I am who I am before God. Those things God affirms are the true me; those things he prohibits are the intrusions of the foreign matter of sin and not part of the personal I was made to be and the Spirit is bringing about” (141). This is the essence of growth and sanctification for the believer in Christ. A mere blog post is an insufficient synopsis of such a substantial work. I admire Keller’s commitment to academic research. He does the heavy lifting of digging up the work of philosophers and social scientists and then lays before the reader his findings in laymen's terms. In this way, we too can engage in thoughtful reflection, critique, and growth in wisdom. Our next Apologia promises to be as rich as the first, as the book culminates in Part Three: Christianity Makes Sense. I’ll bring you the highlights of our second meeting in late July. In the meantime, pick a book and invite some friends to read it with you. Many thanks to Ron Coia for preparing well and making this first Apologia meeting happen! Thank you for sharing your hard work, Ron.